Whenever you have a new console launch, ostensibly there are two camps. The first batch is generally comprised of your day-one-ers and the second group is the wait-and-see-ers. 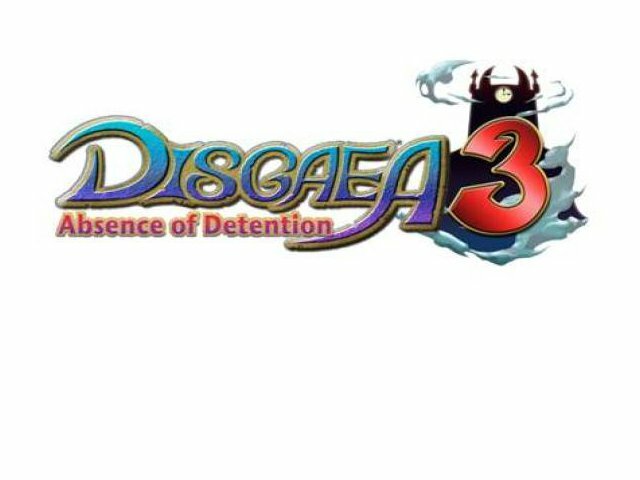 It is my opinion that Disgaea 3: Absence of Detention will convert a few from the second bracket into brand new PS Vita owners. Why? Largely because Sony’s platforms have held dominion over Japanese RPGs to the point that the player base for this genre practically expect it to only appear on Sony gear. However, other equally valid points are the extremely attractive stylized graphics that practically scream for your eyeballs attention and the insanely deep tactical gameplay that resides inside. Two of those three points are extremely superficial and leaves very little for me to weigh in on that could be considered in anyway helpful. I literally make it my job to inform you on the third point though. 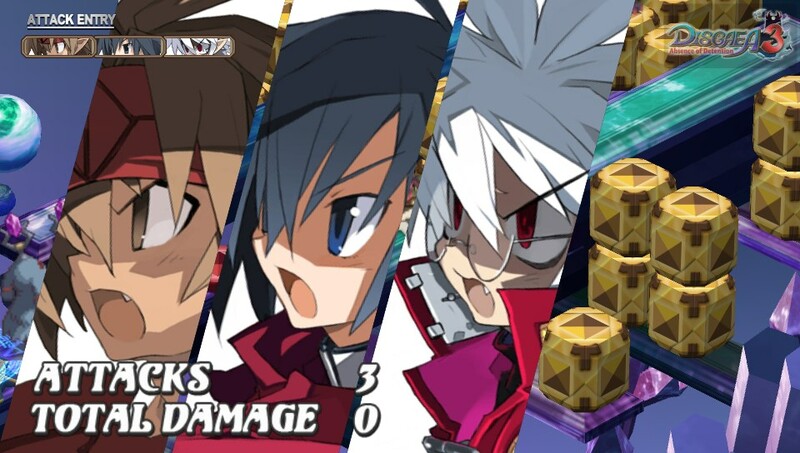 The story line for Disgaea 3: AoD is shallow, at best. The story isn’t bad, it’s just one that is eccentric and juvenile. You play as Mao, a demon prince who wishes to kill his father. It’s impossible to take this serious from the beginning as the dialog and animation have a goofy flair that is constantly at odds with the fourth wall. It’s a lighthearted, feel-good romp that would rather make fun of itself than be serious. Now, I should stress that I haven’t played through all eight chapters (I’ve only played through the first three chapters) and most of my time was actually spent delving into the item-world (I’ll get into this in a moment) so I can’t speak for the entirety of the story being like this. Just the parts that I’ve played exhibit a light mood. 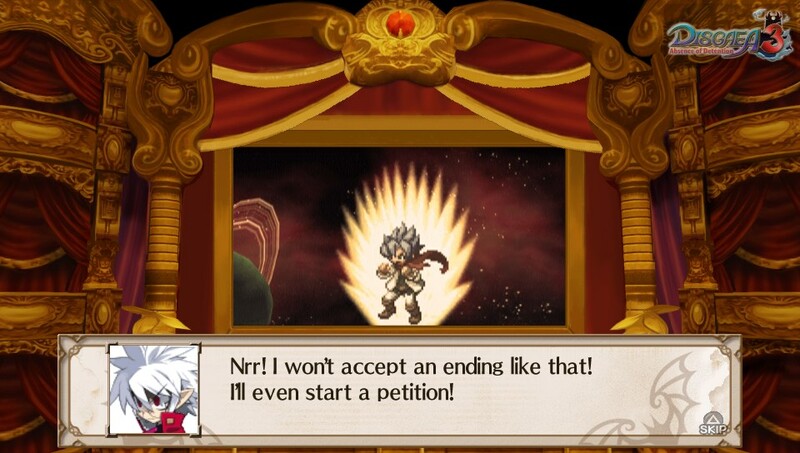 The story is carried out through in-game sprite animation as well as partially animated cut scenes. You have the option of choosing Japanese or English dubbing and I’m actually happy to report that the English dubbing is actually quite good! This is coming from a guy that generally sticks to the Japanese dub with English subtitles. Kudos to the translation team for that! Riffing on the vocal track, the music for the game takes a detour through the scenic route. That is to say, the music is a successful marriage of sound and story. The main looping track in the “base” expresses the game perfectly. Breaking the Fourth Wall Z. Tune in next time! I list some of these things for completeness’ sake as I don’t find all of these features to be worthwhile. Essentially, the GPS functionality, touch controls and data shop are all features I could have lived without. While they are neat additions I don’t feel that they add too much to the overall package. 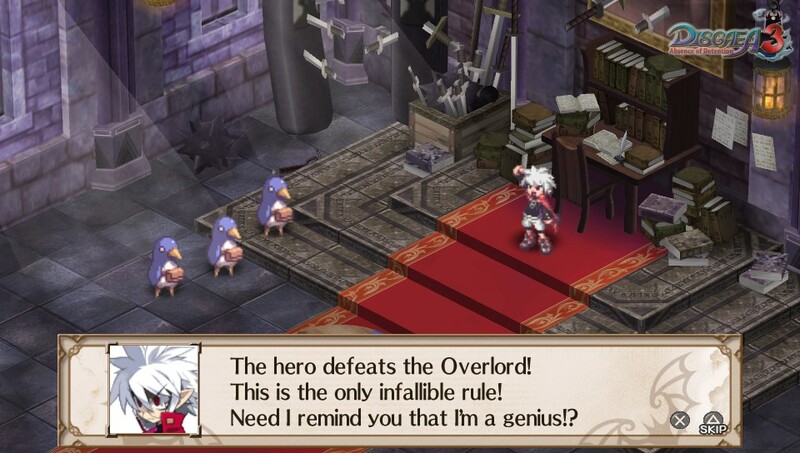 Disgaea 3: AoD is one hell of a tactical RPG. Outside of the core gameplay and ruleset, there are a ton of considerations made to each individual player on how they would like to play this game. 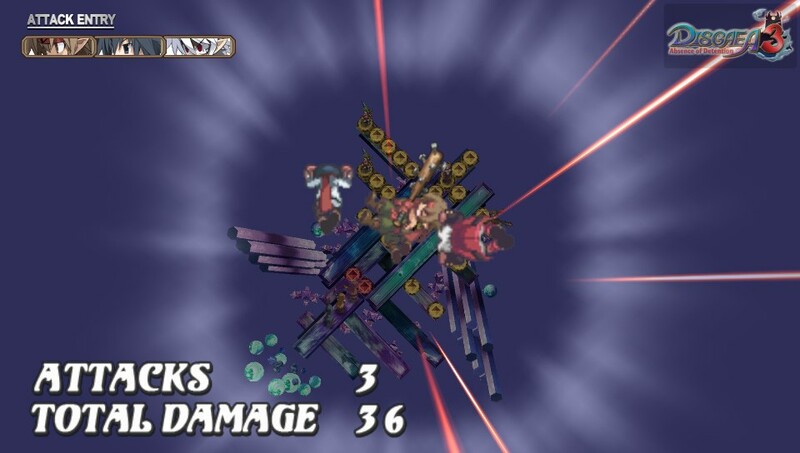 The ability to skip entire story segments at will, skip different types of character animation on the battlefield, the speed at which the animation is carried out. All of the options allow you to carve out your own pace for the game, in essence, gelling with your own rhythm to fully sink your teeth into the game. The cherry on top is the disassociation of level/power for characters/items in reference to the story. How this works is you can elect when you want to have higher level items available in the game through an in-game election process. If it passes, boom, you can now buy higher level items at the item shop. Also, characters can earn mana which they can cash in to learn new skills and spells. À la carte RPG. Another nice departure from traditional RPGs is the random encounters and how you involve yourself in them. Grinding is a funny word. All games are comprised of repeating the same acts over and over again, but it is whether or not this experience is fun or not if the term ‘Grinding’ comes into play. More specifically, grinding is a term generally associated with RPGs because of some progress mechanic be it monetary, experience or some other unit of measurement that needs to be gathered before cashing in. The sole purpose of this is to advance to bigger and better things. This is where the item-world comes into play. What you can do is go to the character named “Item-Worlder” and select an item to be upgraded. How you go about upgrading your item is through ten levels of random encounters. Not only are you electing to put yourself into a random encounter, gaining experience/loot throughout, but you have a goal from the outset. 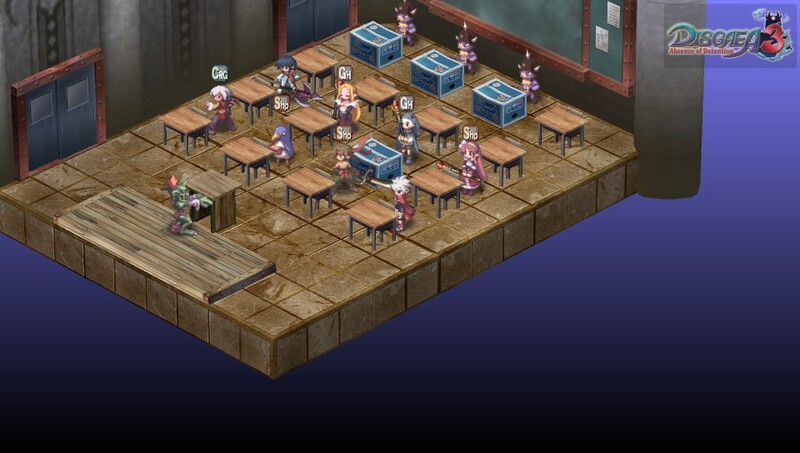 The battle system is carried out through an isometric grid-based layout. 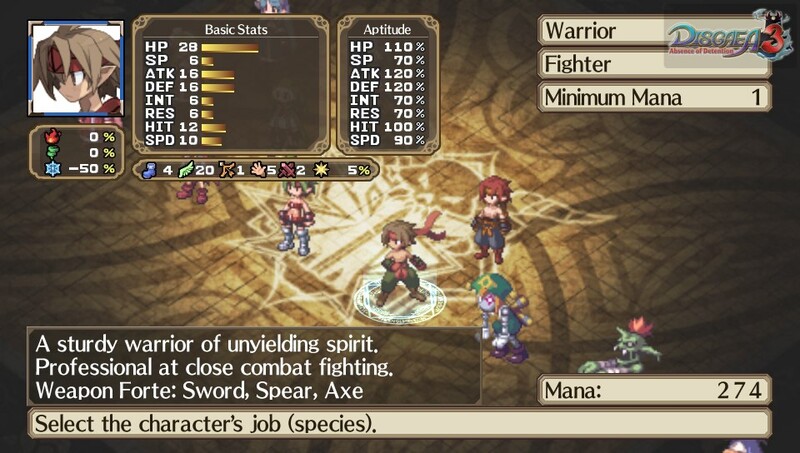 On top of the standard classes/jobs that normally populate Tactical RPGs, Disgaea 3: AoD features an additional twist in that each point in the array can be affected by a color that can govern a different rule. For example, you could be standing on a tile that is colored green and green colored tiles offered reverse damage. 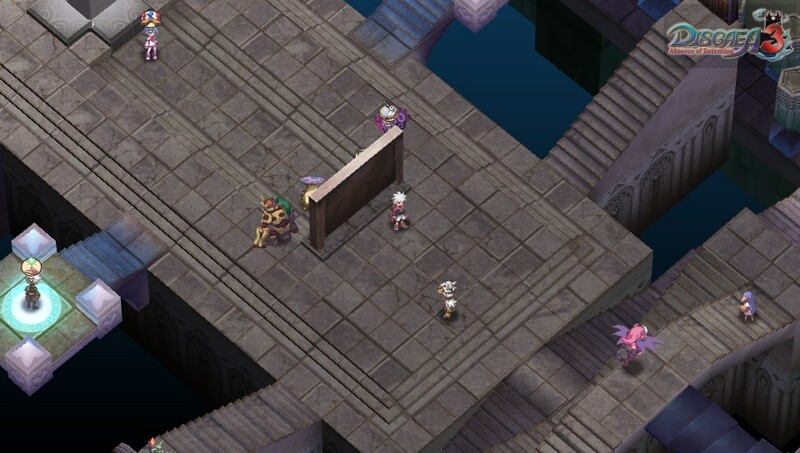 So the only way to do damage to someone on this tile would be to heal them instead of attacking them. To combat against monopolizing on the beneficial tiles, there are also colored cubes which you can destroy to change the color of these tiles. This is a system of Geo Panels and Geo Cubes. Outside of terrain effects, another interesting addition to this genre is the ability to have a subset of monster classes transform into different weapons for other characters. The amount of variety and the complexity to the rulesets is positively dizzying! And to top it all of the maximum level a character can attain is 9999. That’s over nine thousand! Verdict 8.5/10: Solid TRPG/SRPG that no fan of the genre should dismiss. When it will be available on the PSN ? I’m reaching out to NIS America right now to find out the specifics. As soon as I hear back I’ll let you know. As far as I’m aware, the game is slated to release today April 17th. Again, as soon as I have more info, I’ll update. Just got an update Kevin. I’m told the PSN store usually updates around 4PM PST or 7PM EST. So it should only be around another hour before you see it live on the PSN store.